GoodReads Summary: With stunning artwork and a rhyming text, the illustrator of the Mercy Watson books tells a tale of human-animal connection full of humor and heart. What I Think: I was drawn to this book because of the stunning cover. I didn't realize it was the same illustrator who does Kate DiCamillo's Mercy Watson series, but it makes sense because I love those illustrations as well. I love especially how the water is splashing up as the ship makes its way through the sea. I was delighted that the story is every bit as wonderful as the cover. I love animals and its great to see a book where the animals in a circus - a circus run by a not-so-nice owner, too - get to escape their fate of circus-dom. The animals get to show how great they are and the villagers recognize this. My favorite page is when the circus owner comes to town after having tracked down the animals but they are no where to be found while, truthfully, they are right in front of his eyes. A great example of how it's important to pay attention to the illustrations as much as the text. This book is also great for inferring the character traits of the circus owner. 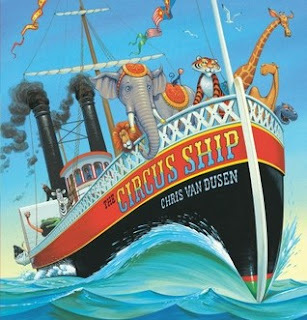 Van Dusen makes it pretty clear what we are supposed to think of the circus owner; he is very clearly a villain. A great chance to talk about story elements and plot in general. Love it! Writing Prompts: Write about what you were able to infer about the circus owner's character (character traits) and compare him to another character or person you know.